The government paid a “one-off settlement” to write off the pension liabilities of a cash-strapped sixth form college as part of a deal to secure new owners and remove it from the public sector, FE Week can exclusively reveal. The Education Funding Agency (EFA) paid Hampshire County Council the undisclosed figure, believed to run into millions, to prevent pension liabilities from being transferred to national crime prevention charity Nacro when it takes on Totton College from November. The deal was announced on Monday (June 22) and came after talks failed with other nearby colleges to merge or take over provision — but writing off pension liabilities was apparently not part of the deals tabled to them by the EFA. He added the EFA therefore paid a “one-off settlement” to the local authority but declined to comment on the sum involved. A merger had been on the horizon for the 1,700-learner Southampton college since December when former principal Mike Gaston said it was looking at options. Sixth Form College Commissioner Peter Mucklow had warned it could not function alone having been placed under Financial Notice to Improve by the EFA. But attempts to merge with nearby Eastleigh College were abandoned in March after the proposals were rejected by Eastleigh’s board and the following month learners were told A-levels were being scrapped to focus on vocational qualifications. It is understood that Brockenhurst College also rejected a deal. 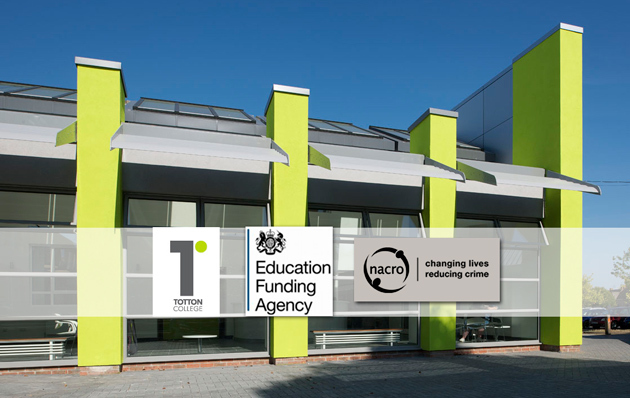 However, FE Week has learned that London-based Nacro, which uses skills and training to try to reduce crime and re-offending, was approached by EFA about taking over Totton, rated inadequate across the headline fields by Ofsted this month, with the proposition that pension liabilities would be written off. Josh Coleman, director of education for Nacro which currently has around 3,200 learners and improved from an ‘inadequate’ Ofsted rating in March 2013 to ‘good’ last June, declined to comment on the pension agreement. However, he said: “There are no skeletons in the cupboard. We were approached by the college and EFA [over joining with Totton]. He added that the deal involved Nacro taking on a £2m commercial loan. Both Eastleigh and Brockenhurst declined to comment whether they had been extended the pension liabilities write-off deal for Totton by the EFA. It’s been a strange few weeks for FE and skills. It’s a sector that has been given its moment to shine with apprenticeships and that 3m target one of the government’s key focuses. And yet of course more recently providers have been kept waiting to find out if there’s any cash for their recent extra apprenticeship starters. Finding money is a problem for all government departments. This is something everybody can agree on, or so we thought. Because we learn that the Education Funding Agency managed to pull out millions from somewhere to allow Totton College to be taken over by the private sector (albeit a charity). The government might argue this money remained in the public sector because it went to Hampshire County Council to write off Totton’s pension liabilities, but it nevertheless represents public money used to sanction privatisation. And if the pensions deal wasn’t or couldn’t have been offered to other colleges to take on Totton, why could the deal not have been incentivised in other ways by the EFA? — After all the money would have stayed in public sector hands with another college. As, crucially, Totton would have too. Its official the privatisation of FE has begun! Hmmm, so the college is Ofsted inadequate and has mismanaged itself into a financial hole? And this ‘deal’ means something continuing on the site for local people? Doesn’t seem that bad to me. I personally don’t like the idea of my daughter who is venerable being taught along side criminals especially the type that puts her at risk!